From a dusty one horse town in the 1960s, Gaborone has now developed into a substantial city of 420,000 inhabitants in the metro area (as of 2011). Generally it is a clean, safe and functioning city that is spreading ever further outwards into a suburban sprawl that today measures about 15 km from east to west. There is a definite city centre based around the train station and the government enclave of Khama Crescent. However, numerous shopping malls are dotted all over the city, diluting the prominence of the downtown area. The Blocks - to the west of the railway line, outside the Western Bypass. The blocks number 5 - 10 running south to north (although Block 9 is an outlier being the southernmost of the blocks, and there is a Block 3 directly north of the downtown area). Some maps (including Google Maps) label the Blocks as high numbered Extensions (e.g. Block 8 is made up of Extensions 35 & 36) but everyone will refer to an area by its block number. Knight Frank, a real estate agent with an office near the Shell Garage on the Main Mall, has a useful map of the city. Customs is very slow, but easy to get through (as appears to be the case for most of Africa). Have an address on hand for where you will be staying and they hardly give you a hassle. -24.55725.9231 Sir Seretse Khama International Airport (GBE IATA) about 15 km north of central Gaborone, is the Botswana's main airport. It is mainly served by flights from other Southern African countries, but there are also flights to Addis Ababa and Nairobi. Air Botswana, in the Main Mall, Phone: 395 1921, . Provides services international connections to Harare (Mondays, Wednesdays, Saturdays) Johannesburg (daily), Lusaka, as well as domestic flights to Francistown, Kasane and Maun. Typical fares from Gabs are in USD 200 - 400 range. South African Express, Offices in the Game City Mall, Broadhurst Mall and Riverwalk Mall, Phone: 397 2397 (Game City), 309 5740 (Broadhurst), . Flies in from Johannesburg. SAA has non-stop service from JNB. In order to fly from Cape Town, it is necessary to connect through JNB. Air Namibia [dead link] flies to / from Windhoek on Mondays, Tuesdays and Thursdays. Air Kenya flies in from Nairobi on Mondays, Wednesdays and Sundays providing a useful alternative to Johannesburg for connections to the rest of the world. Taxi rides from the airport to the city center cost BWP 150. It costs less going to the airport, BWP 60-80. There is a daily bus that connects Pretoria, South Africa with Gaborone, Botswana. The bus is operated by Intercape and the tickets can be booked online at  or purchased at one of their offices. The bus departs from Pretoria Station on Paul Kruger & Scheiding Street at 13:15 and arrives at the Kudu Shell Service Station in Gaborone at 21:10 (an 8 hrs bus ride). This bus makes a brief stop at the Johannesburg bus station to pick up passengers. As of June 2011 the bus fare was R 195.00 rand per person (about $29 USD). The bus is pretty nice: tourist class, reclining seats, and a working bathroom. However, be prepared for the “Christian materials on-board.” Basically, all the movies that are played on the Intercape bus have overly religious messages in them. The border crossing between South Africa and Botswana is pretty straight forward. The passengers get off the bus (without the luggage, just the documentation) at the South African immigration check point to get their exit stamps, then they walk over to the Botswana side to get their entrance visa stamps. The bus attendant stays with the passengers for the process of the border crossing, so the bus is not going to leave anyone behind. Botswana Railways operates two daily trains, one day and one overnight service, linking Gaborone with Francistown as well as Lobatse, near the border with South Africa. 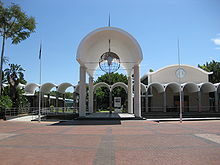 -24.66194125.9046052 Gaborone station is centrally located on Station Rd, behind the huge Station mall. Travelers not used to left side of the road driving should exercise caution while driving and crossing the street, as most of southern Africa (Gaborone, Botswana included) drives on the left. Public taxis are generally small white cars and can be identified by their blue license plates. These cars travel designated routes, generally going to areas/neighbourhoods that combi routes do not. The fare for a taxi is P5.00. Since taxis can only hold a maximum of 5 passengers they also tend to be quicker than a combi in completing their route. You can catch a taxi at many combi stops and ask them to drop you off anywhere along the route. For route information simply ask the driver of the taxi. If you need to go to a particular destination not on the taxi route then ask for a "special", see cab section below. A cab is a private taxi or a "special" which takes you directly from your origin to destination. This may be a public taxi with a blue licence plate or a privately run cab. Generally you must request a cab by phone. There are several cab companies in Gabs and many display contact information on the cab itself. You can also hail public taxis on the road and request a special. To give directions, its usually better to give Plot numbers or easily identified places rather than street names (which aren't commonly used). If a driver gives you a good rate, ask him for his cell phone number and remind him of the place where you are staying. Using one driver the whole time you are in Gaborone can end up saving you money. Don't worry if you hail a cab with someone inside. Offer to split the fare for the destination and save each other some cash. Don't be afraid to try and discuss lower fares. Most trips should be P 20-30 (e.g. Main Mall to Game City is around P30). Combis are white vans that are like mini-buses. Combis cost P4. There are no route maps but there are different lines, so just ask the driver if that line passes where you need to go. If you know the direction you need to go, start walking there -- combis will honk at you as they are passing to let you know they're behind you. Gaborone Cycling Club, ☎ +267 71811472. Actually a mountain biking rather than cycling club. Movies typically cost 40 Pula per seat (February 2012). It is assigned seating, so tell the cashier your preference when buying the ticket. Theaters usually show big-name movies (as a small theater in the US would). There are three cinemas in Gabs, one in Riverwalk Mall, one in Game City Mall and one in Masa Centre. -24.70425.8223 Mokolodi. The highlight of many people's time is a cheetah visit where you can actually pet a cheetah. On a two-hour game drive you might see baboons, giraffe, wart hogs, zebra, elephant, hippo, etc. The guides are always very nice. -24.63525.9654 Gaborone Game Reserve, Maaloso, ☎ +267 318 4492. One of the smaller game reserves, if you have a car you can just drive yourself around. Mostly birds, but some monkeys, wart hogs and ostrich. Recently zebras, wild boars, kudus have been added. It has got picnic spots, but be careful of monkeys and ostriches. Gaborone abounds with shopping malls, and pretty much every South African chain store has at least one branch somewhere in the city. Unfortunately this crowds out local independent shops. Coupled with seemingly rampant collusion and price fixing among retailers makes Gabs a disappointing and quite expensive place to shop, despite the 12% VAT rate undercutting the 14% in South Africa. -24.5630426.034851 Oodi Weavers (about 5km east of Phakalane on the road to Modipane). 10AM - 4.30pm Monday - Friday (closed weekends). Established in 1972 by Swedish apartheid refugee Peder Gowenius this small enterprise produces pleasing tapestries of village scenes and the like (P1,000 Pula for a good sized piece). Any visitor will be encouraged to see the workshop and chat with the weavers. -24.618425.91273 Botswana Craft, Nakadi Street, Broadhurst Industrial. Curiously located in the middle of an industrial estate, Botswana Craft is a little oasis comprising a handful of little cafes and art shops. It's a little too Arikaaner flavoured for some, but an interesting place to browse if you are passing. If you want to buy a Buddhist statue or some scented candles this is the place to go. -24.664525.90624 The Bike Shop, Macheng Way (look for lots of yellow trucks belonging to a neighbouring freight company), ☎ +267 71306146. Great little bike shop selling refurbished cycles shipped over from the US, together with fancy new mountain bikes and accessories. Considerably more professional than nearby Gaborone Garage and Cycles. Gaborone is not an exciting place to eat – and the city suffers more than most from South African culinary hegemony. However if you keep your expectations low there are some interesting nooks and crannies to interest your taste buds. -24.6546825.929566 Par 5 Indian Restaurant, Phala (in Gaborone Golf Club next to Gaborone Sun Hotel), ☎ +267 3912299. Unfussy south Asian cuisine serving a range of meat and veg dishes, including several daals. Nice setting overlooking the golf course, with indoor and outdoor seating. Closed Mondays. Mains P40-60. -24.640825.87727 Beef Baron, in the Grand Palm Walmont hotel. Lunch and dinner. Perhaps Gaborone's most expensive restaurant - the Beef Baron serves up excellent and huge meat dishes - including some game - but cow meat is in the ascendancy. Desserts are good also (inc. the lovely malva pudding). Atmosphere is pretty nice for a hotel restaurant, although there are no windows. Mains from P120. -24.669625.928111 News Café, Village district (At the Mondior Summit Hotel). 6:30-22:30. Conveniently located for those staying at the Mondior Summit, News Café is popular even with outside guests. The menu centers on "European style" dishes, but with some interesting twists. The place really shines in the cocktail department, though. On Friday and Saturday nights, the music is often cranked up loud even though there is no dance floor, so sit outside if you want to make conversation. Staff are young and sometimes inexperienced, but most of the time the service is quite good. Prices are somewhat above the regular fare in Gaborone, but then so is the quality. They have Happy Hour from 5PM-6PM. Buy 1 get 1 free on all cocktails. -24.680125.921112 Pavilion Restaurant, Private Bag BO3 (Plot 50381, Moedi Close, Fairgrounds Office Park), ☎ +267 365 1600, +267 3975555, e-mail: tmogomotsi@fgh.co.bw. Daily, 7:00-22:30, including holidays. Upmarket restaurant which serves buffet lunch, a la carte lunch and dinner. It seats 96 people inside and has a terrace which seats 120 people. One can also relax in the Pavilion Bar for snacks and beverages. BWP 100 upwards. -24.664425.916913 Gold Coin (in Africa Mall). lunch & dinner. The only Thai restaurant in the country? Well almost. The Mandarin on the sign lets slip that this is a Chinese resto with a smattering of Thai dishes on the menu and Bangkok posters on the wall. Still if you are craving coconut milk with your curry its the only option in town. P30 for a simple noodle dish. P70 for a green curry & rice. -24.676625.935814 Primi Piatti. Stylish branch of the South African Italian restaurant chain. A wide variety of meat, pizzas and pastas. Mains from P80 up to P120+ for a big chunk of beef - but quality is among the best in the city. Located in the Riverwalk Mall. Free wifi. -24.683625.955118 The Moghul, 171 Tlokweng Road (inside Oasis Motel), ☎ +267 397 5346. Set under a thatched roof at the back of the Oasis Motel this place serves up flavoursome Indian & Pakistani cooking. However, perhaps because of its hotel location, prices are a little steep and portion sizes disappointing. Takeaway and delivery possible. P50 for a veg curry up to P80 for a Rogan Josh. -24.685725.879820 Mugg & Bean. South African chain coffee and lunch place. Located upstairs in Game City Mall, makes for a noisy indoor shopping mall vibe with adequate coffee. -24.627325.936222 Debonairs, 13141 Segoditshane Way. A popular pizza restaurant that also does deliveries P55 cheapest pizza. -24.619325.912523 Cherry Pepper, 6 Nakedi Road (in Botswana Craft), ☎ +267 7631 4797. breakfast & lunch. Setswana cuisine for the European palette. Excellent lunch option. They serve 3 different dishes each day for P25 - P35 and hence is great value. Try the sauteed goat on Wednesdays of the fried breem on Fridays. Prices for Western goods are at EU prices; local goods (corn meal) are inexpensive at grocery stores. Choppies and OK Foods are local chains - they have the cheapest prices and are located in all areas of Gaborone. Woolworths is in several of the main malls and has much higher quality produce and more European food selections. If you want exotic fruits or vegetables or good cheese, definitely the store to go to. Pick-and-Pay, South African Chain, has better quality and is more expensive than Choppies. ShopRite, South African chain has stores all over Gaborone with lower prices. SPAR in the Main Mall seems to be the cheapest for juices (about 5.25 Pula for 1 Litre of 100% fruit juice). For a budget, buy a pie at Pie Time and then a drink at SPAR! (8.25 Pula for a full meal). -24.707925.90633 Gaborone Yacht Club, Off the old Lobaste road near the railway crossing, ☎ +267 72471977. Evenings Wednesday & Fridays, lunch Saturdays & Sundays. Hidden away down a dusty track to the side of Gaborone dam the Yacht Club bar makes a great sun-downer location. Opening hours are limited, simple food available (e.g., steak-burger & chips P45). P10 entrance. Covers range from 20 to 100 Pula. Many have dress codes. And like most places, the popular nights at each place vary. Check with local Batswana (people from Botswana) for time relevant information. Gaborone compares to South Africa in terms of accommodation choice and costs. There are a handful of large chain hotels costing P800+ offering conference facilities, curio shops, evening restaurants, gyms and bars - and dozens of smaller guesthouses, lodges and bed & breakfasts varying in quality, cleanliness and price. However it is difficult to go much below P400 per night for a room. For those staying for months rather than days there are a handful of relativity expensive serviced apartments, although these are often full. Finally if you have your own car and want to keep away from the city there are some good options out in the bush 15 km to the south of Gabs that cost about the same as a guesthouse in town. There is also one Backpackers hostel in Gaborone. If you travel on a shoestring or are staying in Gabs for weeks or months the following may be of interest. -24.652725.92041 Motheo Apartments, Plot 4710, Moremi Road (off Independence Avenue), ☎ +267 318 1587. Slightly aging compound offering serviced studio, one and two bed apartments and town houses. Daily, monthly and yearly rates available with prices from P9,500 pcm for a studio up to P13,500 pcm for a town house. Book well in advance. Internet is available at a price. -24.673325.93522 Innisfree Apartments, Plot 5004 Boteti Road, The Village (near Riverwalk Mall), ☎ +267 3953603. Comfortable serviced studio and one-bed apartments offering monthly rentals. Wifi is included. P9,000pcm for a double room up to P13,500pcm for a one bed apartment. Pretty popular so book well in advance. -24.659725.8883 Hantom House, G-West Phase 1, e-mail: Alan@Gabz.Biz. Long running expat houseshare for multi-month long stays. -24.64325.91775 African Home, Nyerere Drive (Two streets west of Middlestar shopping centre). Small hotel with a larger wing being constructed out back. Basic but charming design. Staff and amenities are still working out some glitches, for instance assuring that plugs on appliances match outlets. P400/double, including cont. bkfast. -24.676725.94447 Riverside Lodge (first left after crossing the Notwane river on the Tlokweng road, signposted), ☎ +267 3928805. Small lodge comprising about 10 rooms a few minutes from Riverside mall. The grounds are quiet, but it does feel a little like a car park. Rooms have a/c and DSTV. No internet / wifi. Some rooms only have baths (no shower). Not a bad option if looking for somewhere cheap to crash overnight. The prices on the website are long out-of-date. from P360 inc. breakfast. -24.6796125.947428 Royal Apartments Lodge, Plot 256, Tlokweng (Behind Senn Foods, along Tlokweng Road), ☎ +267 3906033. Good value recently built lodge a 1 km walk from Riverside Mall. Rooms have a/c, flatscreen DSTV, fridge, free wi/fi, and are clean and sunny. There is a small pool and pleasant garden out back, with plenty of birdlife contributing to the atmosphere. Cooked breakfasts also nice. from P400 per room. -24.683525.95559 Oasis Motel (2km past Riverwalk Mall along Tlokweng Road), ☎ +267 392 8396. Opened in 1983 Oasis Motel is one of the older hotels in the city. Currently (2012) undergoing a renovation, the hotel boasts 110 rooms, good sized pool, internet, a/c and DSTV. Is a bit far from town if you don't have a car, and lots of noise from the road. The Moghul Indian restaurant is on site. From P590 room only. -24.652425.903910 Masa Square Hotel, Plot 54353, New CBD corner Khama Crescent & Western Bypass (In the CBD), ☎ +267 315 9954. Gaborone's flashy business hotel, opened in June 2012 and is already something of a landmark. Architecture is akin to what you find in the financial districts of European capitals. The highlight is the rooftop pool. Rack rates from US$250 (P1,750)..
-24.6512525.9299111 Gaborone Sun (next to the golf course east of the city centre), ☎ +267 361 6000. Once the premier hotel in the city, the Gabs Sun is now getting a little old and flabby, with the better staff having been poached by the Monidor and Grand Palm hotels, and hence service can be a bit grumpy and slapdash. Nevertheless it has a lovely pool and bar area (happy hour 6-7PM), and some of the rooms (in particular rooms 203–231 odd numbers) are nice, catching the morning sun glinting off the pool. Facilities comprise ubiquitous casino (read: slot machines), squash courts, small gym, conference facilities, buffet breakfast, pay-as-you-go internet etc. At P900+ a night its poor value, but with most guests being Government / businesspeople it can get away with these rates. From P900 per room per night. -24.640725.87812 Grand Palm - Peermont Walmont (west of the city centre), ☎ +267 3637777. Easily the loveliest hotel in Gaborone. Bordering 5 star status, this hotel is a modern oasis with a modern front entrance, a casino to the left and a gigantic and impressive conference centre (The GICC) to the right, marked by an eagle figure flying over a fountain. Out back the hotel has a large swimming pool and a moderately sized lakes that birds frequent. There is also a pool bar that serves food, a children's playground and further afield there is a boma that does barbecue (braai) events and parties. There is also a tennis court and plenty of lush green grass. Inside there is a squash court and a leisure centre. from P1770 per room. -24.639825.879913 Grand Palm - Peermont Metcourt Inn (west of the city centre), ☎ +267 363777. The cheaper 3 star hotel on the Grand Palm site - but rates are still steep, in part because you can still use all the facilities of the Walmont. Breakfast is served in the F.L.A.G. Café. From P720 per room excluding breakfast..
People in Botswana are very friendly and the crime rate is relatively low. However the recent contrast between rich and poor has seen crime on the rise. Always be aware of your surroundings. When going out at night to a restaurant take a taxi called from your hotel. Take the mobile number of your driver and call him when you want to go home. Do not walk around at night away from places with lots of people. At night, do not walk back 5 blocks to your hotel from a pub. Do walk around during the day. Basic common sense will keep you safe from criminals. You should have a safe and pleasant trip as hundreds of thousands of other people have each year. If you're staying at a hotel it is safe, but beware for some residential areas affected by burglars. Stay alert when driving in cars for smash and grabs when using mobile devices near traffic lights (talking on the phone without a handsfree kit is illegal anyways). Beware when walking at evenings/night in street corners as muggings occur, displays of wealth and property make you a target, particularly tempting objects such as mobile phones, laptops. Crowded public areas are a heaven for pickpockets. Be cautious especially if you are a woman with a handbag. Areas often affected by such crimes are near Old Naledi, Mogoditsane, Broadhurst, Phase I and II. Police are honest and helpful but sometimes can be late to respond. When driving to rural areas be extra careful as cows and wildlife often walk in the middle of the road. Be prepared to stop for a herd of goats. Do not drive at night unless you know what you are doing. Drunk driving on weekends and holidays is common and dangerous. Drivers do not look out for or give way to pedestrians. Be very cautious when crossing any street day or night. Do not immediately get out of your car if bumped/hit from behind - drive to a public place (service station/restaurant) to inspect for damage. Do enjoy the beauty! Embassy of the United States, Embassy Drive, ☎ +267 395-3982. -25.0366125.748855 Otse Village (approx. 55 km along A1 road south of Gaborone). 30 minutes' drive from Gaborone. Otse village commonly known as "Letsekela" by its inhabitants of Balete origin is surrounded by hills with Manyelanong on the East and Baratani hill on the West.Manyelanong is one of the only two sites that one has the opportunity to see Cape vultures. Because of its height, difficulty to navigate and cliffs, it provides a perfect breeding ground for vultures. Hence the Mannyelanong Game reserve , established solely for the purpose of protecting these endangered vultures. Baratani hill is popularly known for its one of the most outstanding stories of young lovers who were in a forbidden relationship. They decided to elope and hid in a nearby hill but never came back.Residents ever since then have never climbed this hill for fear of not returning. The village has many stories about its people, one outstanding story is of the brave woman "Bosetlha" who killed a 3m Python which had wrapped itself around her body. Though she is now old but still active, Nkuku Bosetlha confirms she got attacked by the snake on her way coming from the lands, the snake wrapped itself around her body. After unsuccessful shouts for help, she desperately fought for her life by tightly opening the python's mouth wider for approximately 30minutes until good samaritans passed by and cut the snake head with a knife. Kanye, 100 km south, accessible by bus. Francistown is a 5-7 hour bus ride away, there is also an overnight train service. The South African border is just a little more than 10 km away. Nearby destinations in South Africa include Rustenburg, Pilanesberg National Park and Sun City. Johannesburg is about 8 hours away by bus. This city travel guide to Gaborone is a usable article. It has information on how to get there and on restaurants and hotels. An adventurous person could use this article, but please feel free to improve it by editing the page. This travel guide page was last edited at 01:41, on 20 January 2019 by Wikivoyage user Seligne. Based on work by Wikivoyage users Traveler100bot, ShakespeareFan00, Just.tefo, Wrh2Bot, DaGizza, Traveler100 and AndreeBot, Wikivoyage anonymous users 105.235.241.14 and 175.158.226.59 and others.